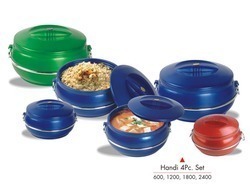 Leading Manufacturer of handi casseroles from Mumbai. Multi colour packs is one of the renowned names of the market engaged in offering an excellent range of Handi Casseroles in the market. These casseroles are designed by a team of experts, using high quality raw material procured from the reliable sources. Moreover, we can customise these products as per clients' specific requirements.